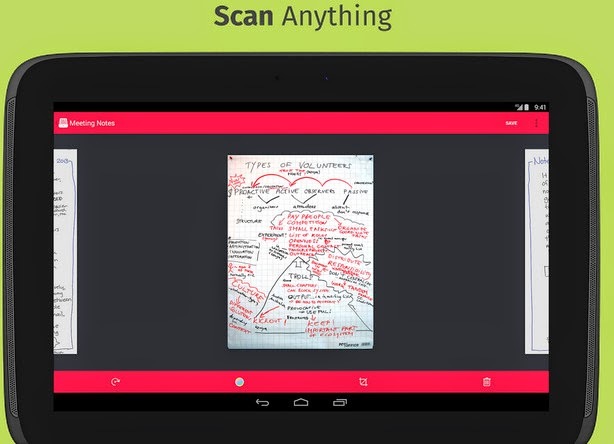 Scanbot is your premium mobile scanner app. Create premium quality PDF scans. Send them via email or upload them to Google Drive, Box, Dropbox, Evernote and other cloud services. 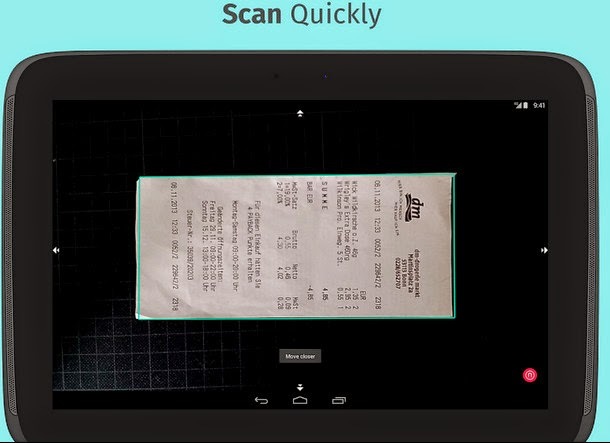 Scanbot relies on the latest and most advanced mobile scanning technology available. Your scans are delivered at a premium quality with over 200 dpi, which is comparable to the performance of modern desktop scanners. In addition, various color modes, auto optimization and blur-reduction help you to get the most out of your scans. Scanbot is blazing fast. Just hold your Android phone over any document, receipt or whiteboard and it takes only a second to scan a page and save it as a PDF. 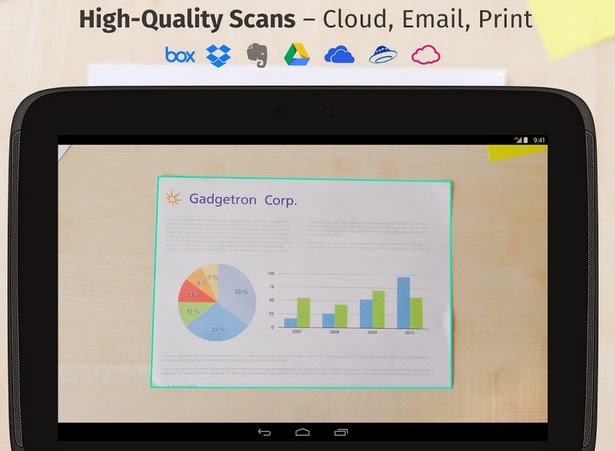 Thanks to Scanbot's latest scanning technology, the edges of the document are automatically identified so that only the document itself is scanned. Scanbot captures the best possible image in the perfect moment. You don't have to do anything! Scanbot works on all occasions with all kinds of media. Scan any kind of document such as standard paper documents, business cards, receipts, notes, whiteboards or newspaper articles. Scanbot helps you save the documents that are important for you and get rid of paper clutter – no matter whether you are in the supermarket, at work or on holidays. Be sure that we'll add more cloud drives in the future. • Scan any document that is important for you: invoices, receipts, business cards, tickets, meeting minutes, whiteboard notes, newspaper articles, contracts, travel vouchers etc. • Process your scans effectively and efficiently: Email, print or automatically upload your scans to your favorite cloud drive. • Save time and money: get premium quality scans in the widely accepted PDF format in over 200 dpi – there's no need to buy a huge and expensive desktop scanner. • While traveling: scan tickets, boarding passes, IDs or receipts on the go. Never have the feeling again you missed a document when arriving at your destination or at home. • Students: How often did you forget what your professor wrote the whiteboard or flipchart in that last lecture? With Scanbot you can capture and share the notes with your fellow colleagues instantaneously. • Business: Scanbot helps you scan your invoices, receipts, contracts, meeting minutes or other business documents. 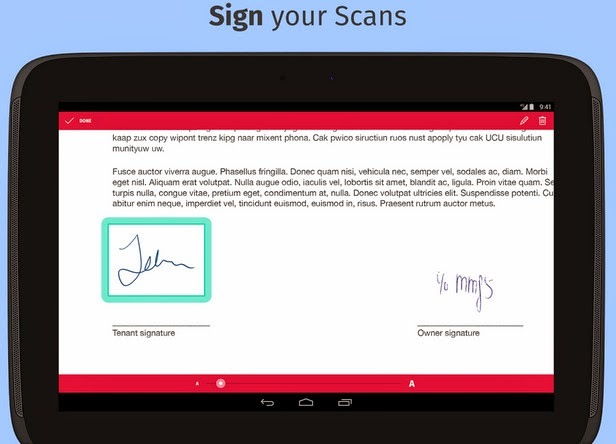 Scanning multiple pages lets you even create one PDF scan out of a multi-page contract. - Bugfixes – thanks for your feedback!